For the English sport shooter, see Amber Hill (sport shooter). 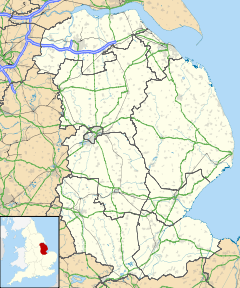 Amber Hill is a village and civil parish in Lincolnshire, England, approximately 6 miles (10 km) west-north-west from Boston. The 2001 Census measured its population at 268, increasing to 294 at the 2011 census. The name Amber Hill reputedly comes from the village standing on a seam of amber coloured gravel. Amber Hill was a plot of 30 acres allotted under the Holland Fen Enclosure Award to provide materials for repairing the roads of several parishes having rights of common on Holland Fen. It was formed a civil parish in 1880. The village is one of eighteen parishes which, together with Boston, form the Borough of Boston. The local government has been arranged in this way since the reorganization of 1 April 1974, which resulted from the Local Government Act 1972. This parish forms part of the Swineshead and Holland Fen electoral ward. Hitherto, the parish formed part of Boston Rural District, in the Parts of Holland. Holland was one of the three divisions (formally known as parts) of the traditional county of Lincolnshire. Since the Local Government Act of 1888, Holland had been, in most respects, a county in itself. Amber Hill church, dedicated to Saint John the Baptist, was built in 1867 and is a Grade II listed building. It was made redundant in 1995 and sold as a private dwelling house. The graveyard is still public, and interments still take place there. A scoop wheel and channel on Claydike Bank was built in the 19th century of red brick, cast iron, and wood. It was originally belt-driven, and is Grade II listed. Toftstead County Primary School was built in 1881, extended in 1969—at the time of the closure of Hedgehog Bridge at Brothertoft and Barley Sheaf School at Holland Fen—and finally closed in 2010. Jubilee Park Playing Field children's recreation area was opened in 2005 after five years of planning and fundraising by local people. Wikimedia Commons has media related to Amber Hill. ^ "Amber Hill Parish". Lincolnshire County Council. Retrieved 9 May 2011. ^ "Lincs To The Past". Settlement of Amber Hill. Lincolnshire Archives. Retrieved 9 May 2011. ^ "British Listed Buildings". British Listed Buildings. Retrieved 9 May 2011. ^ "Lincs To The Past". Amber Hill Tower Mill. Lincolnshire Archives. Retrieved 9 May 2011. ^ "Amber Hill Parish". Amber Hill Drainage Scoop Wheel. Lincolnshire County Council. Retrieved 9 May 2011. ^ "Lincs to the Past". Lincolnshire Archives. Retrieved 9 May 2011. ^ "Vision of Britain". Retrieved 25 August 2011. This page was last edited on 28 October 2017, at 20:40 (UTC).